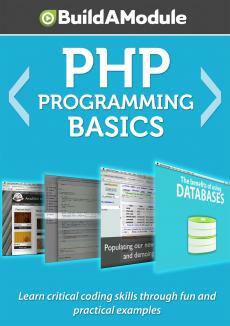 In this video, we're going to look at working with variables in PHP. So go ahead and go to your resource pack directory, and in the strings and variables folder go ahead and open up the fourth step which is called string variable dot step. Go ahead and copy the code and paste it over the code that's currently in your text dot php file. This is a file that you should have created in previous videos. This is a simple example of using a variable. Let's go ahead and check it out in the browser. So I'm going to jump to the browser and refresh the test dot php file. Notice it says "Hello, world!" Now, the difference between this Hello, world! And the Hello, world! that we had previously is that this is dynamic. We can change the word "world.
" I'm going to jump back to the editor. So this first line is where we define the variable and the second line is where we use it in a print statement. Now, you may remember from algebra that a variable holds some kind of value. It's like a pointer to a value that can change over time. In algebra, variables stand for numbers of some kind, but in PHP, variables can hold all kinds of data. So think of a variable as a little package that can include all kinds of things. It can include the entire content of a web page. It can include a number. It can include some other types of data that we're going to be talking about later.